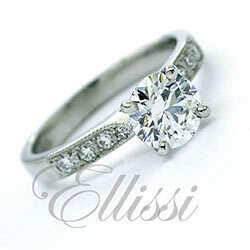 Home / Engagement rings: Custom Design / Cushion Cut / “Julia” Cushion cut diamond cluster ring. 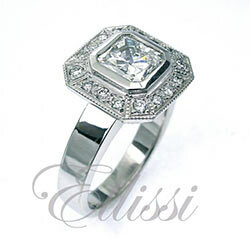 “Julia” Cushion cut diamond cluster ring. 18ct white gold handmade cluster design ring set to the centre in four split claws with one approximately 6.5mm x 5.4mm cushion cut Diamond of known weight 1.0ct GIA Colour E, Clarity SI1. 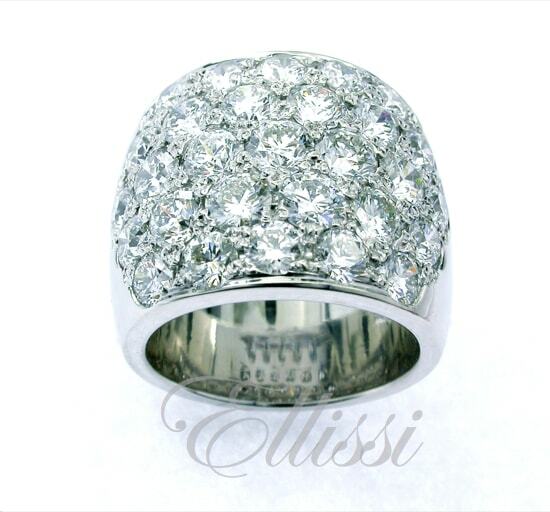 The ring is grain set to the plate surround with eighteen approximately 1.2mm — 1.3mm in diameter round brilliant cut Diamonds held on four millegrain edged splayed pillars each set with one approximately 1.3mm in diameter round brilliant cut Diamond to swept up shoulders grain and rim set with a further sixteen approximately 1.3mm in diameter round brilliant cut Diamonds on a 2.3mm wide half round shank. 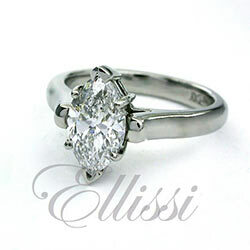 Total known weight of small Diamonds: 38 = 0.40ct (graded as Colour: F, Clarity: VS).